Howdy! Senior writer Jason Heller here. Just wanted to let you know that Science Friction, The A.V. Club’s monthly science fiction film series, continues tonight at Alamo Drafthouse Cinema Denver with Naked Lunch. 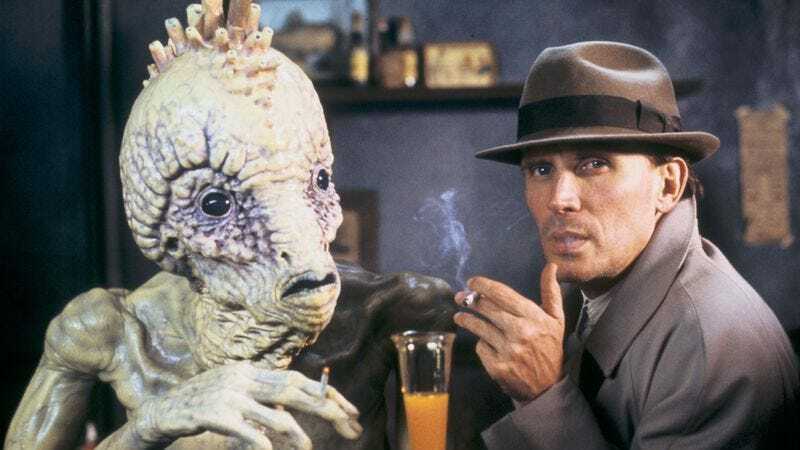 Written and directed by David Cronenberg, the 1991 adaption of William S. Burroughs’ transgressive masterpiece stars Peter Weller as William Lee, a distorted version of Burroughs himself, as the exterminator-turned-secret-agent navigates a grotesque, surreal zone of metafiction, insectoid typewriters, and hallucinatory rapture. And much like Burroughs’ body of work, the film warps the parameters of what science fiction can be and do. Like Fantastique, Science Friction’s sister series that focuses on fantasy films, Science Friction is curated and hosted by yours truly. I’ll be there in person tonight to introduce Naked Lunch and pick the winner of this month’s giveaway: a signed copy of my latest book, the official Goosebumps movie tie-in Slappy’s Revenge, courtesy of Scholastic Books. Like all Science Friction and Fantastique screenings, this event is sponsored by The A.V. Club. Tickets for Naked Lunch are on sale now.